The prettiest fairy in all of fairyland is Angela, but this story is about her little sister, Sweet Sara. Sweet Sara got her name from eating so much chocolate. She also is a bit more plump than most of the other fairies. Whenever Sweet Sara sees chocolate, she eats it, even if she is full. 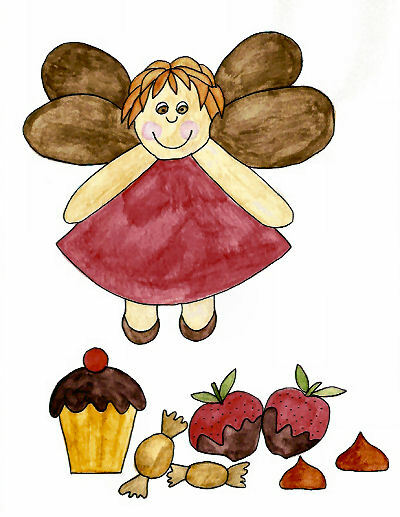 She eats chocolate cupcakes, chocolate drops, chocolate-covered strawberries and chocolate eclairs. On her birthday she ate the entire chocolate birthday cake all by herself. She didn't even share one bite with her big sister. Sweet Sara also ate the entire carton of chocolate ice cream with all the chocolate topping. When she went to bed, Sweet Sara felt very sick. All night long she cried that her tummy hurt. The next day she didn't feel quite so bad, but when her mama put a bowl of chocolate crisp cereal in front of her, Sweet Sara passed it to her sister. From then on whenever she ate chocolate, she only ate a little bit at a time.